Spray corn with cooking spray and liberally season the corn with the seasoning. Wrap seasoned corn in foil and roast in the preheated oven for 30-45 minutes. Carefully unwrap, squeeze lime over corn and sprinkle some quesco fresco. 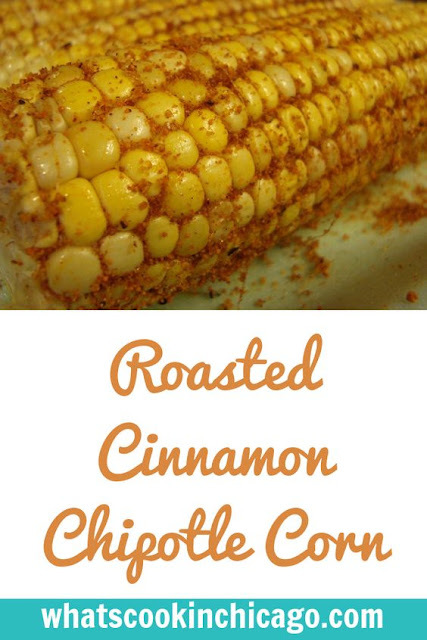 I never would have thought of putting cinnamon and corn together! I bet this was a multiple-napkin affair! What a great flavor combination. I love the idea of the sweet with the spicy. THey make something like this by my house in pilsen. I love it in the summer time! The cinnamon sounds really interesting.